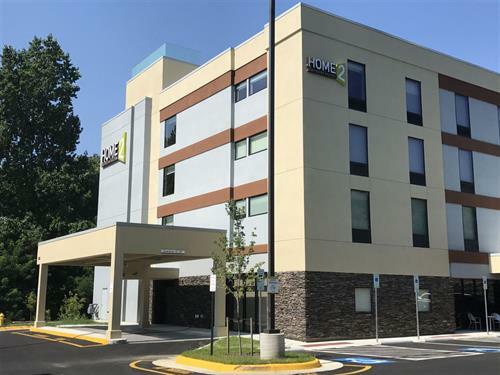 Settle in and stay a while at our new Home2 Suites by Hilton Stafford Quantico extended stay hotel. Our brand new state-of-the-art hotel is centrally located just minutes from the Quantico Marine Base and the FBI Academy. You’ll feel right at home in our spacious suites offering a well-equipped kitchen complete with a full-size refrigerator, dishes, microwave and flatware. The movable furniture lets you create a home or office space just right for you. Choose from a stylish studio suite or opt for more space in one of our one-bedroom suites which includes a sofa bed in the separate living area. Unwind at the indoor saline pool or cozy up by the fire on our outdoor patio. Wake up to our complimentary breakfast of over 400 various options including hot breakfast sandwiches, fresh fruit, coffee and juices. Gather with others around the Inspired Table and swap travel stories while sharing a meal or relax in our warm and inviting lobby Oasis with outdoor lounge. Manage your time effectively at our Spin2 Cycle Center—Laundry and Fitness Facility. Forget your toothbrush? Our 24-hour Home2 MKT has the necessities you need from toiletries to snacks and frozen meals.